Okay, the secret is out: I'm originally from Wisconsin, the dairy state. It's where you can go to the state fair and get one of the best darn giant cream puffs on the planet. I'm fortunate enough to have wonderful childhood memories of ending summer vacations with an adventure to the Wisconsin State Fair gawk over the cows; scream my head off on the exciting rides; visit with relatives at the family picnic--and finally, trace over to the pavilion and eat a cream puff. What's special about a Wisconsin State Fair cream puff? It's extra large puff pastry and cold pile-high whip cream. I was able to find a couple of recipes on the internet for the cream puff. 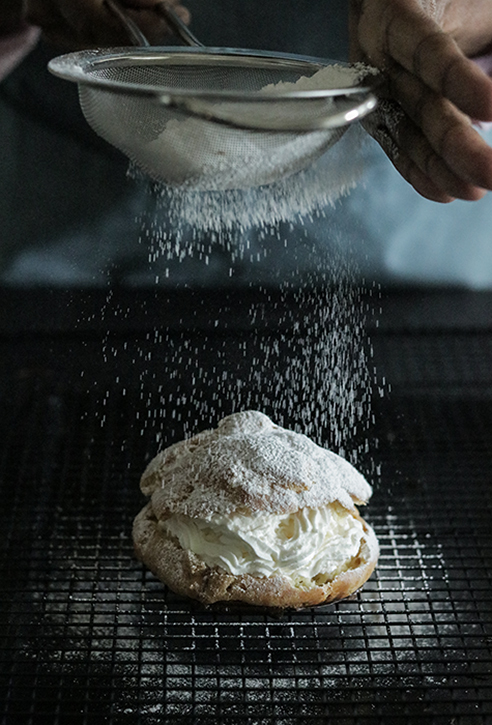 And that's what you'll find in this recipe for a giant cream puff, a melding of the two recipes with some tweaking on its preparation. The orginal serving size based on the other two recipes is 10 to 12. I came up with eight. A critical step in the baking process is to release the steam. The recipes called for using a toothpic. This didn't work for me. My first batch of puff pastry fell flat and were soggy. In my next batch, first I did NOT open the oven door while the pastries baked. The next critical step to keep the puff pastries from collapsing, was open the oven door, pull out the baking rack and with a small paring knife and slash into each pastry. The image below is just an illustration. Puff pastries should be crisp and firm on the outside and hollow inside. My copy-cat Wisconsin State Fair puff pastries were 3-1/2 to 4 inches in diameter. And finally, of course lots and lots of powered sugar! Over medium heat, add water and salt to a Dutch oven or large saucepan. Add butter and allow it to melt. Raise heat if necessary to bring the ingredients just to a boil. Remove pot or pan from heat and add all of the flour. With a wooden spoon, mix ingredients until a ball is formed. Add eggs--one at a time, mixing the ingredients. Immediately, drop 1/4 cups full of the pastry onto the baking sheet about 2-3 inches apart. 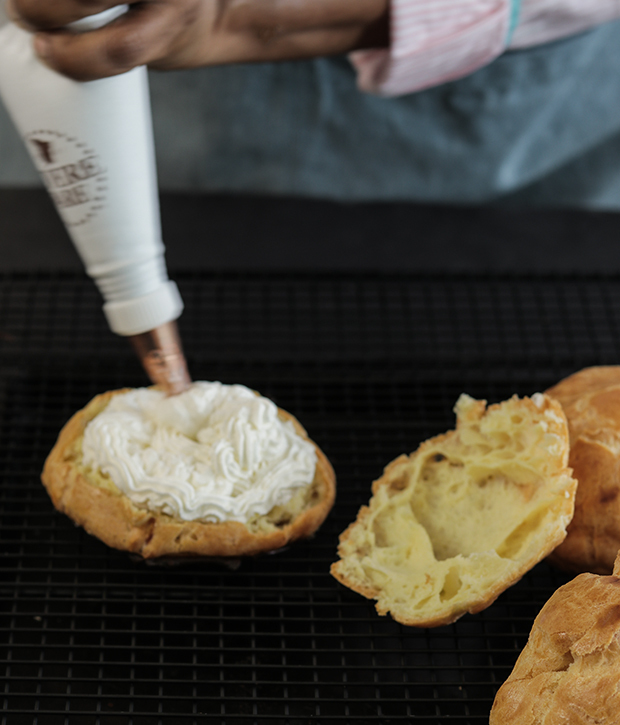 With a pastry brush, dab the tops of each with the egg yolk and milk mixture. Be careful not to allow the glaze to pour onto the baking sheet or the droppings will form burned pieces at the bottom of the pastry. Not to worry, it's not the end of the world and the pieces can be pulled off. Place the baking sheet in the oven and bake for 15 minutes. Reduce the heat to 375 degrees F and bake for 30 minutes. DO NOT OPEN THE OVEN DOOR WHILE PASTRIES ARE BAKING! Allow pastries to cool on a rack. While the pastries cool, remove bowl and whisk from the freezer. Add the heavy whipping cream, sugar and vanilla extract to the bowl. Whisk the ingredient until stiff. Prepare cream puff. Cut the puffs in half and fill one half with whip cream. Top with the second half and garnish with powdered sugar. 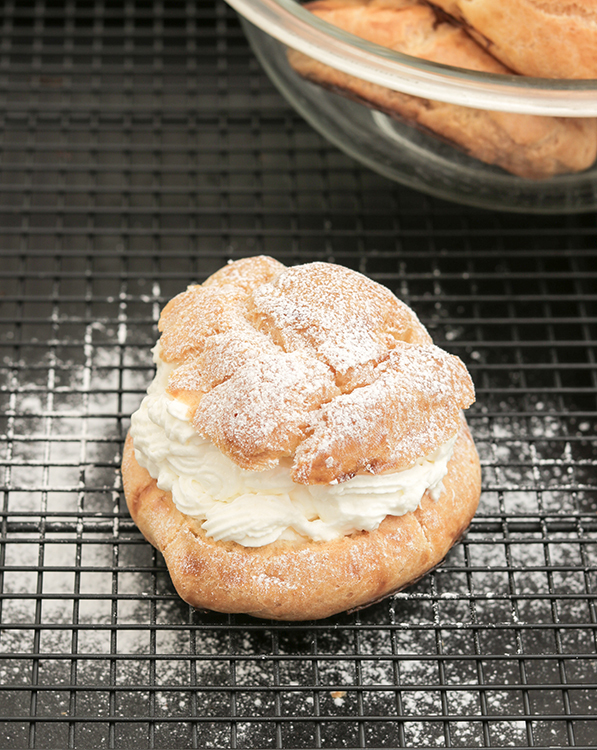 Holding the botton half of the cream puff with one hand, use the second hand to hold the top of the cream puff. Give the top a little twist, about half way and lift up. You should have a heap of whip cream on both halves. Eat one half at a time. I loved these cream puffs but that’s just me. I sure hope you’ll give me feedback in the comment section below.